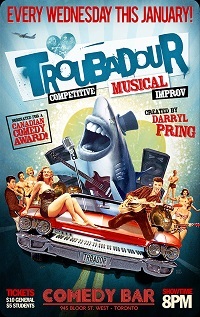 To become champion of the troubadours at Comedy Bar! Troubadour – playing each Wednesday in January at Comedy Bar is a tournament-style production where audience members vote for their favourite performer’s storyline until one is crowned victorious. As you may have guessed from the poem (or maybe even the title), there’s a musical twist – it’s all done with some good ol’ fashioned song and dance. And as with any truly improvised show, there’s always the potential for sheer comedic gold. However, there’s also the chance for a bit to fall completely flat. But that’s what makes improv truly exciting: every show is never exactly the same. On the night I attended, I would say the good skit/bad skit ratio was about even. While the evening’s performance featured tired stereotypes about Mexican tourism, as well as explicit laugh-grabs pertaining to achieving all your hopes and dreams by way of sexual favours, it also included some very unique premises as well, including an off-the-wall narrative about trying to take over the world using Legos. If you’ve ever tried improv, you can probably appreciate the level of concentration required just to keep the plot going. Now, try also having to sing in-key and to the beat. Given the mental gymnastics required for all this, I can definitely appreciate the effort given by the show’s performers. For their part, each and every improviser seemed truly in their element. Stand-out stars of the night included emcee and show creator Darryl Pring, whose comedic timing and stage direction really held the show together, as well as funny man Jason Agnew for his completely out there and random sense of humour. Just when you think you have a skit figured out, Agnew would throw a plot twist completely out of left field. It really kept the production fresh and unpredictable throughout. If you’re a fan of crude, slapstick improv comedy and hoedown-style musical numbers, and you’re willing to sit through a few bad skits in order to chance upon one or two truly fantastic ones, Troubadour is just the show you’re looking for. But if you prefer your plotlines to be more linear and structured, this probably isn’t the production for you. Tickets cost $10 for general admission and $5 for students. You can get them online, as well as in person at the box office.